Burgers are one of the most commonly grilled meats, as well as one of the most incorrectly cooked. Get 10 tips for grilling the perfect burger, from BBQ Makes Everything Better. Try out these tips on this All-American Stuffed Burger recipe. Don’t ever use premade frozen patties. They might be convenient, but they’re typically made from low-grade meat that dries out or burns before the center is fully cooked. We prefer to use a heaping portion of 85/15 ground sirloin found at the fresh meat counter in the grocery store. The fat will keep your burger juicy and moist, yet there’s enough lean to prevent extreme shrinkage. Season your meat! There’s a universe of different seasonings that can take your everyday burger to a new state of being. Yes, burgers have been scientifically proven to increase your at-oneness-with-the-world level! When making burgers, always press the patties 1 inch wider than the diameter of your bun with the center being slightly thinner than the edges. As the meat cooks and the fat renders, the patties will shrink and pull to the center of the burger. If you compensate for this during patty construction, you’ll end up with perfectly uniform burgers instead of grilled meatballs. Always keep the lid of your grill closed while your burgers are cooking. We like our patties thick and meaty, so keeping the lid closed will trap the heat and create an oven effect that will help cook the inside of the burger while the outside is searing on the grates. We live by the theory that the less you play with your meat, the better. This means that once you place your burgers on the grill, the only time they should be touched is when you flip them over. We flip our burgers once and only once. The less you’re poking and prodding at the meat, the better chance you have of keeping all those flavorful juices trapped inside. Whatever you do, DO NOT smash the burgers with your spatula while grilling. This is THE cardinal sin of burger grilling and is one of the biggest reasons for having a dry burger. While this does make the fire sizzle and smoke, you’re squeezing out all the juices that give the burger its delicious flavor. If you’re glazing your burgers, always apply the glaze at the very end of the cooking process. 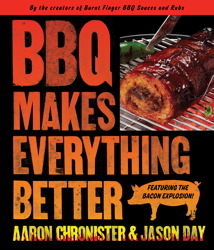 Most barbecue sauces are made with sugar, which burns easily over the high heat of a grill. Applying your burger lacquer during the last two minutes of cooking will provide enough time for the sauce to reduce without scorching. Melting cheese over a burger is always a great idea. The technique is just the same as applying a glaze in that you want to carry out this action at the very end of the cooking process. 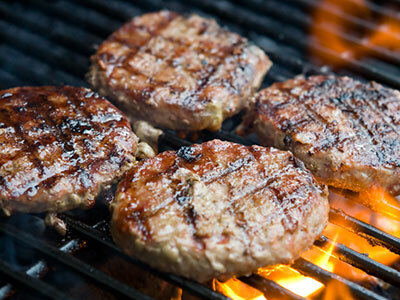 During the last minute on the grill, top each patty with a slice of cheese and close the lid. The trapped heat will soften the cheese just as the burgers finish cooking. Rare (pinkish red center): 3 to 4 minutes per side or an internal temperature of 145 degrees. The burger will feel mostly soft with a slight firmness. Medium (mostly brown with a slightly pink center): 5 to 6 minutes per side or an internal temperature of 160 degrees. The burger will feel firm yet spongy and have juices forming on the surface. Well Done (thoroughly browned with no traces of pink): 7 to 8 minutes per side or an internal temperature of 175 degrees. The burger will be firm and the juices will be clear. Always toast your buns. This may be more of a personal preference, but the crunchy texture of a toasted bun paired with a soft and juicy burger is a match made in heaven. More grilling dos and don’ts.